Got an active guy or gal in your life? Then you gotta introduce them to Brave Soldier. Brave Soldier started with the active athlete in mind. Their products can be broken down into four sections: Skin Protection, First Aid, Skin Care, and Skin Shaving Care making finding your perfect product even easier! There are several Brave Soldier products that are in both my car and home. My husband and I both have Brave Soldier Crash Paks in our cars. They have definitely come in handy with our three year old injuring herself while traveling or just on the go. They are light weight, in a water proof package, and fit perfectly in either the console or glove box of your car. The packets include everything you need for approximately four major "booboos". I use it as a replacement for a first aid kit....AND it's only $12! Brave Soldier Clean Skin is an awesome facial cleanser. It was even recently raved about by Heidi Klum. It's simple...and the bottle last forever! I love the fact that it's gentle, yet is also able to put some of the moisture lost throughout the day back into my skin. This is one of the few cleansers that both my husband and I agree on! You definitely can't argue with the price either....at $18 for 8 ounces, it is definitely an affordable option. If you have a loved one who enjoys cycling or running and struggles with the joys of chaving...then a fantastic product for them is Brave Soldier Friction Zone (Silicon Skin Protectant). The Friction Zone's unique formula is long lasting providing cyclists and runners hours of comfort even in wet weather! It is also safe and effective for wet suits and running shoes making it a fantastic option for triathletes. If you have a son or grandson who plays football, then this is also a great choice since it can help create a barrier and shield the skin from protective gear....especially during summer training! 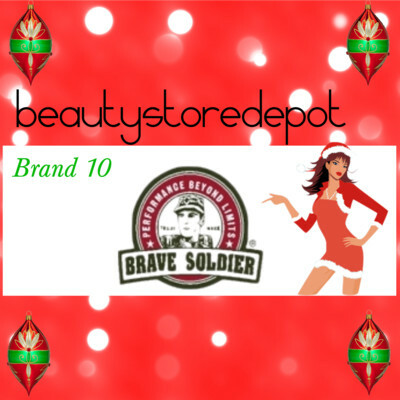 Brave Soldier is one of our featured brands this week during our 12 Brands of Christmas promo. We will be giving away a BE BRAVE Kit including: BRAVE SHAVE, CLEAN SKIN, CODE BLUE, and a LIP DEFENDER. This is the PERFECT gift for the beloved athlete in your life. Wanna win? Just follow us on Facebook for more details on how to win, FREE professional advice, samples, games, and so much more! Don't forget....we are also giving away a Clarisonic on our Google+ page. To enter all you need to do is start following our page and keep an eye out for the posts asking you to enter to win. Good luck! Sounds like some good products! Awesome giveaway... the products are so affordable too! They really are and you're very welcome!! I know....that's one of my favorite things about this line is that it does what it says...AND is actually affordable! Thanks for following our blog!